Have you ever felt an earthquake? Can you imagine what it would have felt like if it was 10 times stronger? How about 100 times stronger? In the early morning hours of April 18, 1906, people in San Francisco did not have to use their imaginations - they lived it! What do the following pictures tell us about their experience? What if a similar earthquake happened in San Diego? 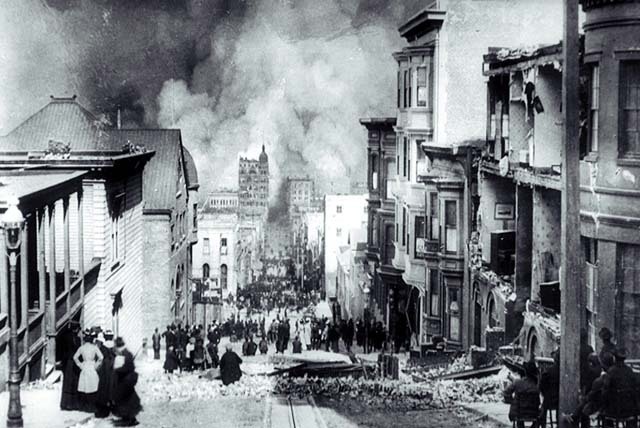 What would it be like to experience an earthquake like the one that struck San Francisco in 1906? What was the damage to the city, and what was it like to live there afterwards? Where do big earthquakes occur most often in California and why? 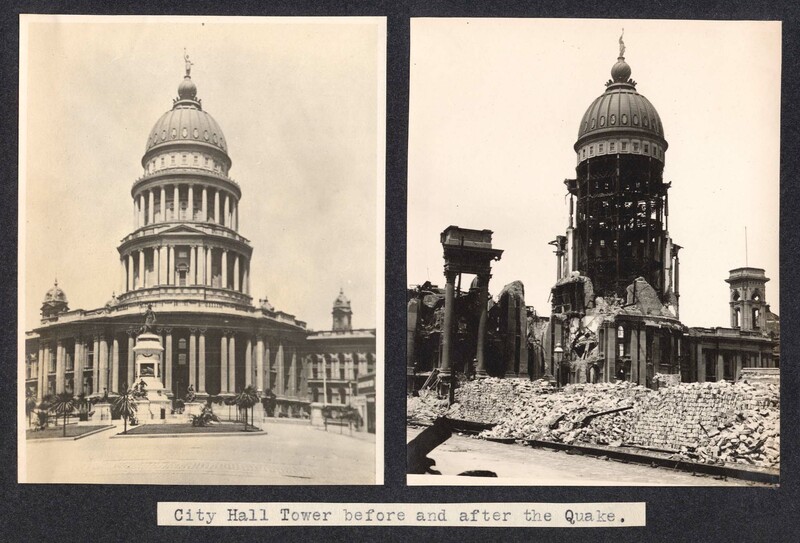 Students should create a concept map to help guide their inquiry process, then write a story, letter, or visual presentation that describes the experience of living through the 1906 San Francisco earthquake. Students should create a map of California that indicates the location of high magnitude earthquakes, and the location of the North American, Pacific, and Juan de Fuca tectonic plates in order to make connections between these pieces of data. 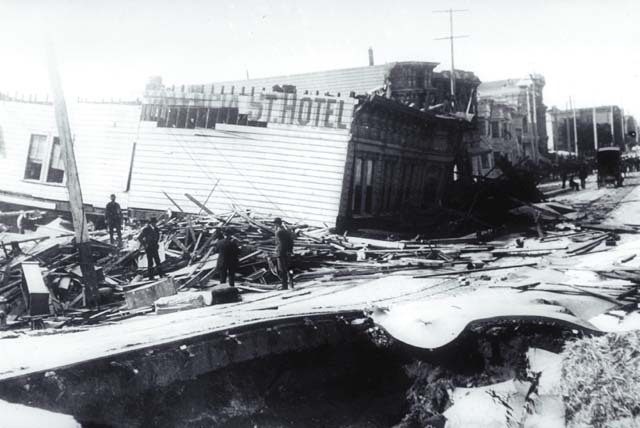 First person accounts of the earthquake, photographs, newspaper articles and various public documents from the period can be found at http://www.sfmuseum.org/1906/06.html. The following is an example of the process students might go through in the analysis of data in order to develop answers to their questions. For the first two questions, concept mapping can be used to delve into the primary sources provided at the Virtual Museum of San Francisco (http://www.sfmuseum.org/1906/06.html). Working in teams, students should start their concept maps with commonly asked questions about what it would be like to experience a major earthquake. Click here to see an example starting point for a student concept map. http://www.consrv.ca.gov/cgs/rghm/quakes/eq_chron.htm - A list of magnitude 6.5 or greater earthquake locations from 1769 to the present. - Maps indicating the location of all the significant earthquakes in California in the last 200 years. http://pasadena.wr.usgs.gov/images/cahist_eqs.gif - Map showing location of magnitude 6.5 or greater earthquakes and major faults in California. http://www.consrv.ca.gov/cgs/information/publications/teacher_features/faults.htm - Map showing location of major faults in California. http://pubs.usgs.gov/publications/text/slabs.html - Another map showing the earth’s plates. Conclusions which can be drawn from this process are listed below in the Findings section. Once students complete their concept map, each team can choose how to present to the class their findings on what it felt like to experience the earthquake and its aftermath. Student presentations could be in the form of a narrative, written story, visual presentation, or dramatic reenactment. For an example of a story based on the final concept map from the Analysis section, click here. Magnitude 6.5 or greater earthquakes in the past 200 years in California are clustered primarily in certain areas of the state, namely the San Francisco Bay Area, the coastal southwest, the Eastern Sierra region, and the coastal Northwest. The location of these earthquakes corresponds to the location of major earthquake faults in California. The earthquakes concentrated in the coastal regions appear to occur where the Pacific, North American, and Juan de Fuca plates meet. The movement of tectonic plates against each is a possible explanation for the earthquakes in 3 of the 4 regions that have concentrations of magnitude 6.5 or greater earthquakes. Students should present their conclusions in writing as an attachment to their map of California. I accounted for almost all the major earthquakes in California except for those in the Eastern Sierras. What caused those earthquakes? Where do scientists predict the next big earthquake will hit in California? What can I do to prepare for a major earthquake?